I was a bit disappointed and a lot underwhelmed when I saw The Whales of August (1987) when it was new, and watching it for the second time via Kino's new Blu-ray, that opinion, alas, remains unchanged. It's a slight drama to begin with, about two elderly, widowed sisters summering in Maine, one causing considerable grief and concern for the other, but what's there is hampered further by the miscasting of Bette Davis, whose alarming, almost cadaverous appearance and forceful, cantankerous personality throws off the subtlety of the other performances. Directed by Lindsay Anderson, from the same-named play by David Berry, the movie is notable for its cast. Co-star Lillian Gish was 93 at the time; it was the great silent film actress's final role, and she more than Davis carries the film, such as it is. If there's another feature film so dominated by an older leading player, I'm unaware of it. Davis, despite playing the part of the older sister, was a much younger 78, but years of ill health - breast cancer, four strokes, a hysterectomy - left her emaciated and physically feeble. Also in the cast are 75-year-old Vincent Price, his health in obvious decline; and 77-year-old Ann Sothern, who after a 1974 injury that fractured her lower spine, put on a lot of weight and had trouble walking thereafter. 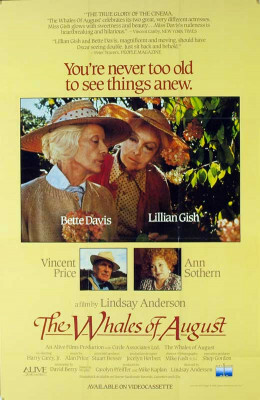 Indeed, the entire main cast of The Whales of August is pretty unsteady on their feet. Comparative youngster Harry Carey, Jr., then 65, has a smaller supporting role. Unexpectedly, Kino's Blu-ray is positively packed with well-chosen extra features, which go a long way to offset disappointment with the feature presentation. The movie is rather vague about the details but, according to the play, the story is set in 1954 when Elizabeth "Libby" (Davis) is 86 while her younger sibling, Sarah (Gish), is 75. On Maine's Cliff Island, Sarah longs for a picture window to replace two smaller ones, but Libby vetoes the idea: it'll cost too much and, anyway, they're not going to be around much longer to enjoy it. Blind many years and profoundly bitter, Libby obsesses about death and is rude to everyone around her, especially long-suffering Sarah, who has the patience of a saint. Other characters are introduced. Tisha (Sothern) is their lifelong friend, her vivaciousness and positive attitude masking her own worries about the future. She suggests to Sarah that it might be better to put Libby into long-term nursing care, sell the house, and move in with her instead. Meanwhile, Nicholas Maranov (Price), a white Russian, has depended upon the kindness of strangers, so to speak, staying with another lonely, elderly widow who has recently died, leaving his future uncertain. Harry Carey, Jr. turns up now and then as a local handyman, noted for racket he makes whenever he's around. The movie, of course, is a kind of On Golden Pond, but about siblings instead of an old married couple. Sarah, despite her age, manages the house, looks after Libby, spends time in her garden, admiring the flowers, and generally gets on with life. Libby, on the other hand, sits in her rocking chair all but waiting for death to come and take her. This naturally distresses Sarah who doesn't know what to do about it. The biggest problem with the film is the casting. Though obviously quite elderly, Gish is charming without ever once being "cute" as movies about the elderly generally insist upon. And, near the end of the film, she displays a firmness that reassures her and the movie audience that she'll be fine in her old age. A fine actress (if you have any doubt, see 1919's Broken Blossoms, in which she one of the greatest film performances ever), Gish had resolutely 19th century features, really looking like someone from another era. Davis, on the other hand, had been a great Hollywood star of the 1930s who worked hard and took on the world to maintain her status as a great movie actress. In one of the extra features, Malcolm McDowell reads from Lindsay Anderson's insightful diaries, contrasting the quiet professionalism of Gish, who might change lines and forcefully offer suggestions, but ultimately knew she was there to service the film at large, with Davis, whose preemptive adversarial approach entailed constant bullying and insults. Although this is somewhat in keeping with the characters each plays, it also results in two very different actors acting in two different styles. The contrast borders on comical: Davis as Libby screeches, "S-a-r-a-h! Is my hair as white as our mother's?" Davis sounding like a Bette Davis imitator imitating Baby Jane, while Gish, with her bridgework: "I shaspect show, Libby." Gish, for her part, caps an 84-year (!) acting career on a kind of high note, merely by surviving her scenes with Davis, but also in a number of good vignettes without her, especially alone by turn with Price and Sothern. Davis, on the other hand, seems grouchily determined to define the movie on her terms. We admire her tenacity and merely surviving, but she never entirely disappears into play's character as Gish does. Rather, Davis reminds one of Groucho Marx's sad final years, shuffling semi-coherently through his one-man show when he should have been in bed; or Bob Hope's refusal to abandon the limelight into his 90s, prompting Johnny Carson's famous remark, "If I ever get to be like that, just shoot me." Despite an unconvincing accent, Price is quite charming as the white Russian, who may or may not be all that he claims to be, while Sothern, giving the best performance, subtly hints at the insecurity she feels, masking it with breezy practicality. Interiors of a real cottage, full of marvelous period detail, was used, rather than recreated on a soundstage, another complaint of Davis's. But this allowed natural light through the windows at various times of day, creating a wonderful sense of atmosphere. Presented in its original 1.85:1 widescreen, The Whales of August looks good, the encoding showing the warm locations to fullest advantage. The DTS-HD Master Audio, 2.0 mono, is fine; this isn't the picture to give one's sound system a workout, after all. Optional English subtitles are offered on this Region "A" disc. Supplements about: an audio Commentary with producer Mike Kaplan, moderated by film critic Stephen Farber; "Peer Talk": Interviews with Davis (very standoffish), Gish, Price, Sothern and Carey; "Behind the Camera": a 1986 interviews with director Anderson, cinematographer Mike Fash and production designer Jocelyn Herbert; new interviews with actresses Mary Steenburgen, Margaret Ladd, and Tisha Sterling (Sothern's daughter), who play younger versions of Libby, Sarah, and Tisha in the superfluous prologue; a new interview with executive producer Shep Gordon; "Never Apologize": Malcolm McDowell discussing Lindsay Anderson and the making of the film; "You Can Never Tell," a song performed by Tisha Sterling, written by Mike Kaplan; and trailer. Also included is a 16-page booklet. Definitely worth seeing for its cast alone, The Whales of August is with reservations Recommended.